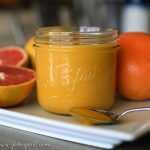 Naturally sweetened, citrus spread that can be used as a topping for fruit, tart filling and more. Heat the grapefruit juice in a small pan until it is reduced to 1/3 cup. Whisk the yolks, honey, concentrated grapefruit juice, lemon juice, zest and salt together in a medium-size bowl over a simmering pot of water (or double-boiler). Whisk consistently until the curd is thickened and coats the sides of the bowl, approximately 10-15 minutes. Remove the bowl from the pan, add the ghee, butter or coconut oil and stir until melted. Run the curd through a fine-mesh sieve to remove the zest and any scrambled bits of egg. Pour into a jar and refrigerate. The curd will thicken as it cools. Store the curd in the refrigerator for up to 1 week or freeze for up to 6 months.